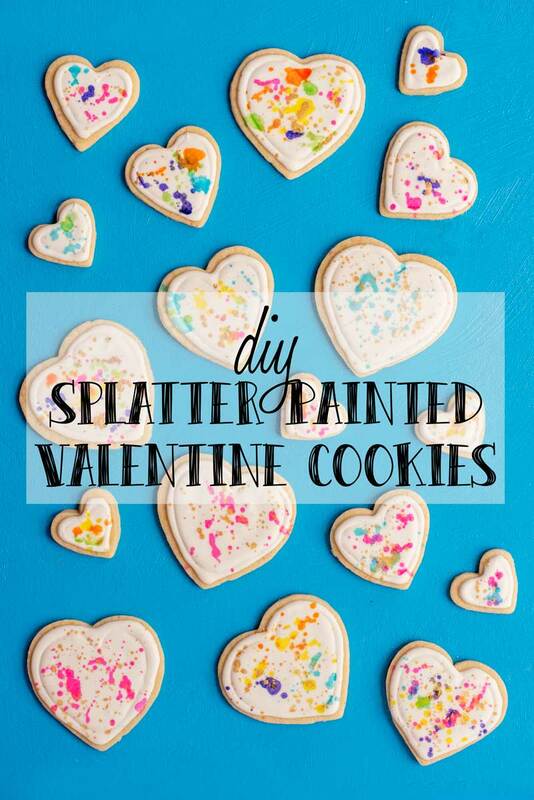 Have fun playing with your food with these easy & colorful splatter paint heart cookies. It’s a fun DIY just in time for Valentine’s Day! 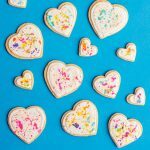 Today I want to share with you a fun and easy way to upgrade your regular Valentine heart sugar cookies. I’ve used this splatter paint technique once before to decorate macarons and they looked so great! 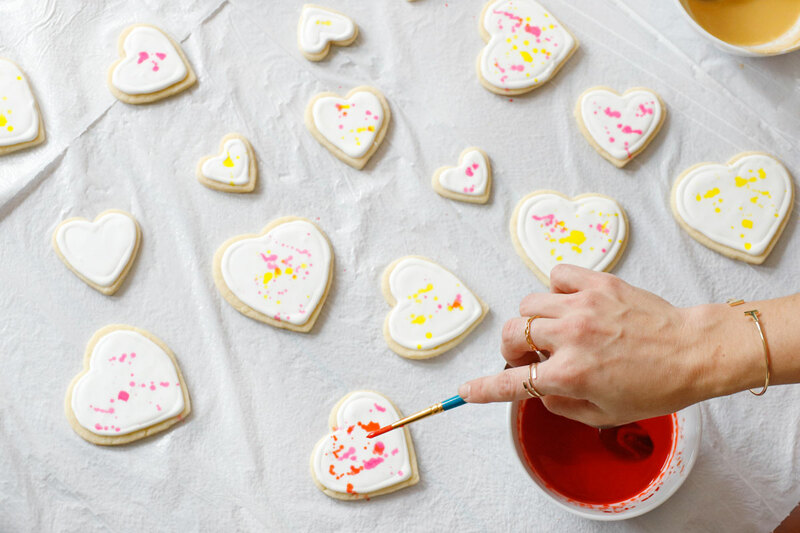 It turned out just as well on these heart cookies decorated with royal icing. The reason the royal icing works so well is that it sets with a smooth finish so the dye won’t bleed or run. 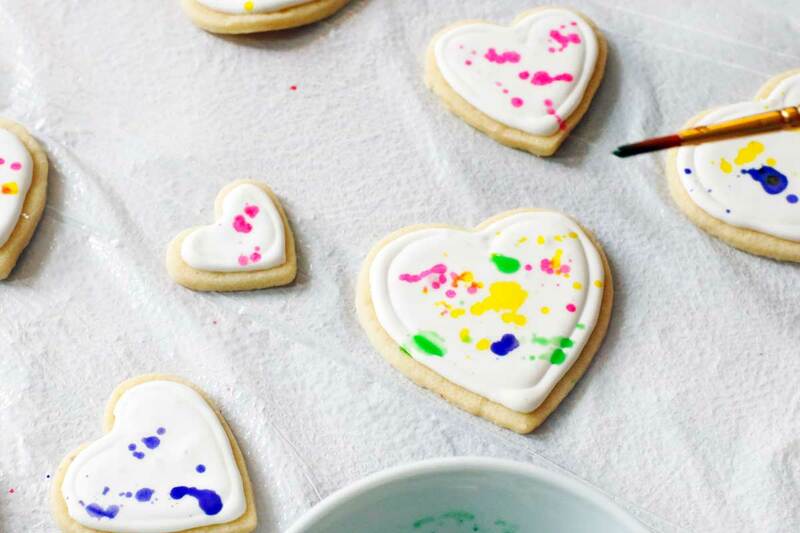 This is one of those food DIYs where making them is almost as fun as eating them, so I invited my friend Ally to DIY them with me.We spent the afternoon playing with food paint and decorating our cookies. We even turned the day into a video for her Youtube channel, along with a couple of other easy dessert DIYs that are perfect for your Valentine. You can see them all after the jump! If a picture is worth a thousand words, then this video of Ally and I made of our afternoon must be worth a million! Also included are a couple of other fun and easy dessert DIYs that I’ve done. 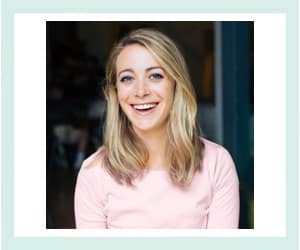 You can see a ton more recipes and fun DIYs on Ally’s YouTube Channel. Check her out! Thanks for reading A Side of Sweet! For more Sweet in your life, you can find me on Instagram, Pinterest, Facebook, YouTube, Bloglovin‘, Snapchat (@asideofsweet), or Twitter. You can also subscribe to receive a weekly email with new posts. Recipe for edible food paint, edible gold luster paint, and tips for working with edible food paint can be found HERE. Cover your work surface. Consider wearing gloves as the food paint can stain. 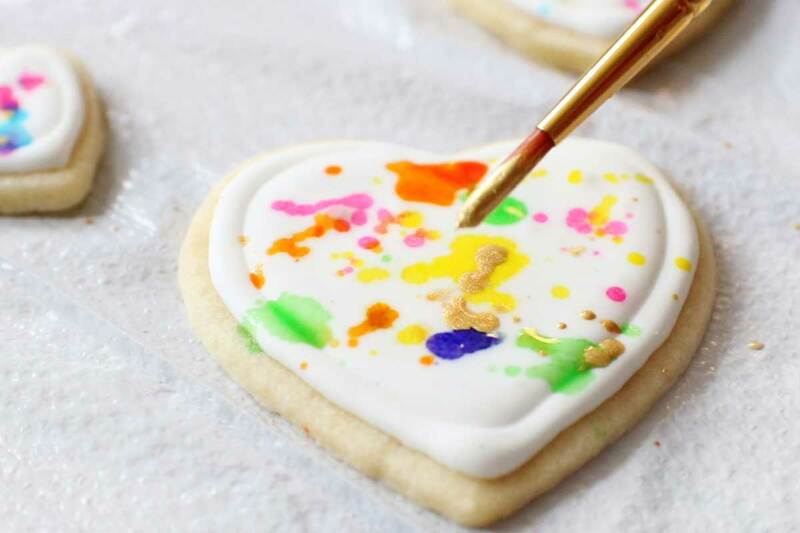 “Splatter” the paint on your frosted cookies by dabbing your brush in the gel coloring mixture, holding the brush between your thumb and middle finger and tapping the brush with your second finger. You can vary the vigor of your taps to create differently sized splatters. P.S. 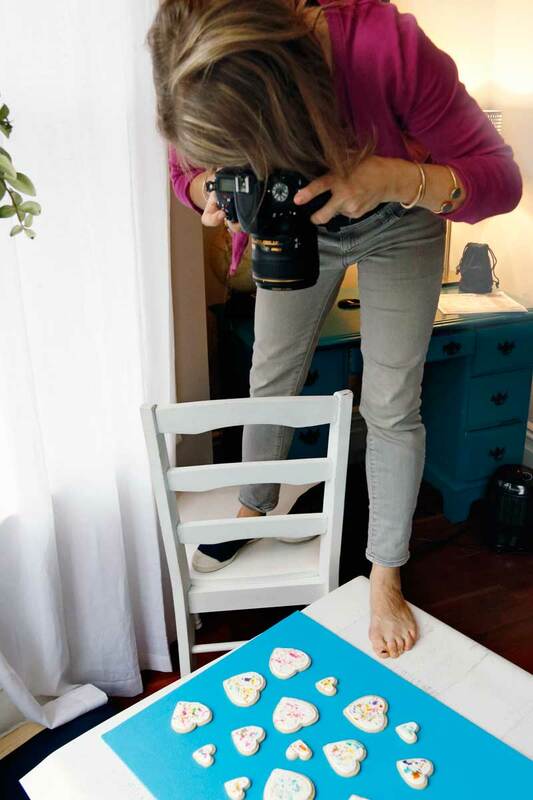 – Do you ever wonder what ‘getting the shot’ really looks like? I’ve been sharing a lot of blogging behind the scenes, photography tips and fun adventures on Snapchat. Just add me using the username ‘ASideofSweet‘ to follow along! Soooooooooo cool! I am so in love with this recipe. Also love the backstage photos. I have been in some of those positions before!!! Yay! Thanks! I think it’s something every blogger can relate to! Thanks so much! They are fun AND easy, I promise! Thanks Kelly! It was such a fun afternoon and the video turned out so amazing thanks to Ally’s talents! Thank you for sharing this fun DIY with me! My viewers loved the creativity and use of color. You’re a true artist. Can’t wait to see what’s to come! You guys are so cute in the video! 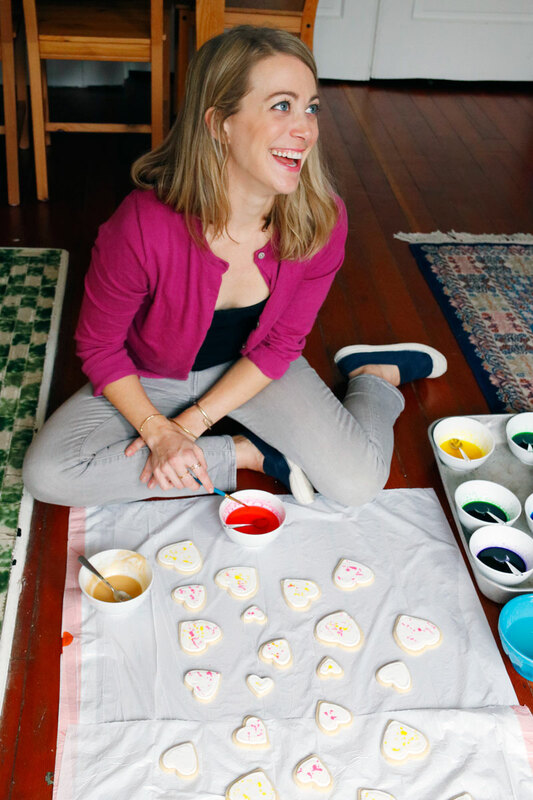 I love seeing bloggers ‘in real life’ – nd it was great to see exactly how abstract your painting is with the cookies too – it’s a gorgeous effect. 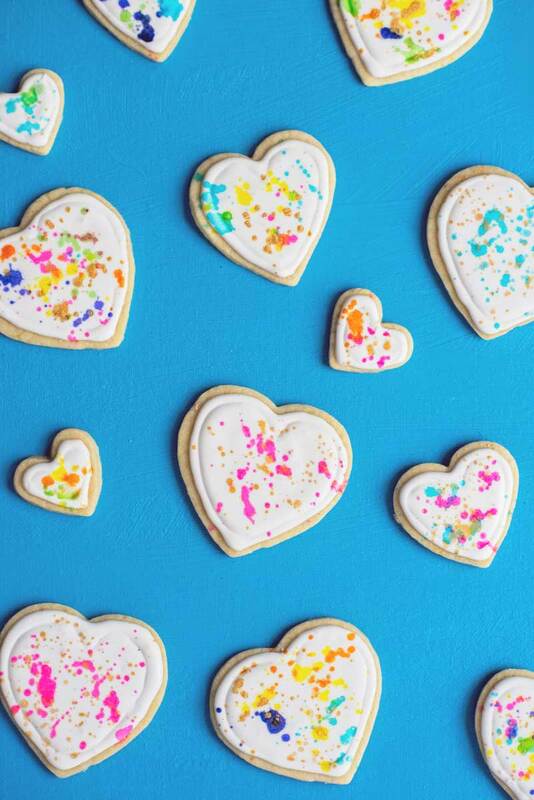 Gorgeous cookie idea, I have never seen this before. Wow, wouldn’t the kids have fun making these cookies. Then they even get to eat them, more fun. Thanks for sharing. Thanks for stopping by Darlene! If you do make them make sure you tag me in any social media photos so I can check them out! I will for sure Kelly. You are welcome.